There are critical conversations necessary to engage people in ways that predictably turn leads into prospects, prospects into clients, clients into people who take action on your advice, happily pay you for planning and advice, and refer you to their friends, family, and colleagues. These conversations are easy to understand but hard to master. Many FAs have a basic level of ability with these conversations, but this article is about elevating from basic ability to virtuoso skillfulness. Consider what could happen to the quality of your client service and the value of your business when you can artfully engage anyone, any time, and anywhere. Critical Conversation #1: Mastery of the first conversation. Every future Ideal Client relationship starts with a stranger. However, you choose to prospect and market, your ability to engage strangers is critical to your success. How do you engage a person or couple, in any situation or environment, in a way that inspires them to want to talk to you again without coming across like a financial salesperson trolling for business? This skill is about asking the right questions, listening with empathy, hearing what’s most meaningful, important, significant, and compelling to them, and then being able to make an offer to take a simple first step that’s relevant FOR THEM. Let’s say you’re at a wedding. What’s the obvious first question when you meet someone new, aka: a stranger? “Are you a friend of the bride or the groom?” What’s the next question? “How do you know ________?” And the next question is what really separates the conversation virtuosos from most mortals with decent “social skills.” The typical person asks something superficial like, “what do you and _______ do for fun?” The virtuoso asks a question that’s more meaningful and emotional like, “You and ______ met at an important time in your lives. What did you learn from _______ that has helped you become a better human being?” Listen. Listen with empathy and ask, “and how has that impacted your life?” Continue to listen: “tell me more about that” several times. This critical conversation process can be implemented as part of any prospecting or marketing strategy and when you meet new people in your normal course of living. Eg: at dinner parties, on the golf course, after church, at a charity event, etc. How would mastering this critical conversation help you grow your business with Ideal Clients? Critical Conversation #2: Mastery at scheduling the appointment. How do you inspire people, both spouses, to come to your office with all of their financial documents? Given all the demands on their time and all of their options for getting financial education, information, advice, and products… what will be the reason they agree to take the time to get their financial documents together and carve time out of their busy work schedules or retirement activities to come see you? When they come to see you, what will you do for them that’s valuable whether they become a client or not? Can you articulate how it’s in their best interest to come to you instead of meeting them in their home or office? What will you say is the benefit for their spouse to be in the meeting if they tell you that they take care of the money and their spouse is not interested in meeting with a financial advisor? How will your meeting be more interesting than discussions about finances, economics, investments, taxes, insurance, or markets? Critical Conversation #3: Mastery at opening the first face-to-face meeting. People have embedded in their subconscious minds an imaginary trust dial. And everything you say and do moves the needle on the trust dial one direction… or the other. This is especially important to recognize during the first 45 to 60 seconds of your first face-to-face meeting with a future client. It HAS to be scripted. It has to be scripted word-for-word and you have to practice those words over and over and over again until you are brilliantly effective. Not just at delivering the words, but with the right tonality, the right facial expressions, and with a totally trustworthy way of being. Do you remember the scene from the movie Jerry McGuire when Renee Zelweiger’s character said, “You had me at hello?” That’s your goal: to have them at hello. Here’s our script: “Welcome to our office Bob & Susan. The fact that you took the time to gather your financial documents and made time in your busy schedules to be here today makes a statement about the importance you place on making smart choices about your money, is that true?” Pause so they can answer. Take a few moments to consider which direction the needle moved on the trust dial, and why, during that 45-second opening. Can you imagine any virtuoso who does not record and review their performances? How else could you possibly become a virtuoso? You can’t. Critical Conversation #4: Mastery at making an emotional connection in the face-to-face interview. What follows the opening is a conversation with each spouse about personal core values. Core values are the emotional why that drive all of their important decisions. Most FAs jump too quickly into asking clients about goals, needs, or wants without laying an emotional foundation of why people want what they want. The skill to set this emotional foundation is crucial. Why always precedes what. Values are represented by words like security, freedom, family, making a difference in the community or the world, satisfaction, fulfillment, inner peace, oneness with God, happiness, nirvana, etc. Values are more about being, while goals are more about doing and having. Critical Conversation #5: Mastery at helping people define clear targets with specific dates and amounts of money wanted. Goals are the tangible what they want to be built on the foundation of their values. You can develop the skill to lead an emotionally compelling and inspiring goals conversation about. It’s a skill, an art form actually. And it’s learnable. One mistake often made by FAs is that instead of asking a question about goals they suggest goals with statements like, “If you’re like a lot of people in your 40s or 50s or 60s you are probably concerned about retirement.” The risk is that many people have a negative association with the term retirement. 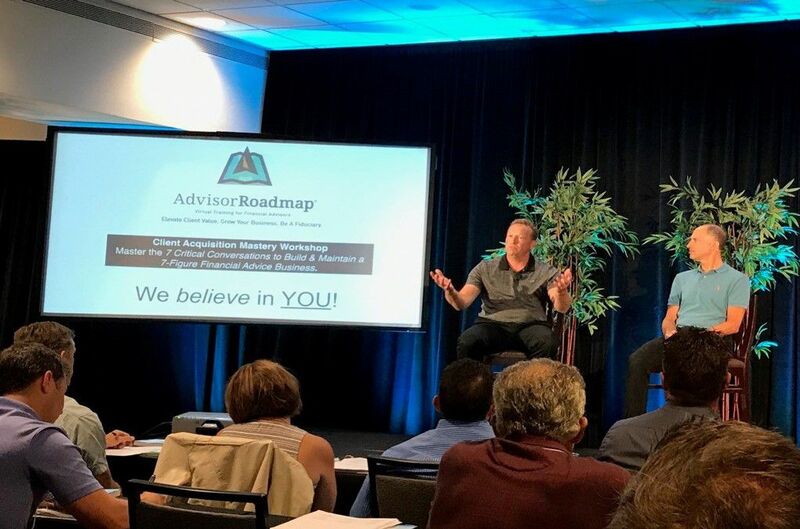 During our workshops for prospects and clients, as well as with advisors, I often ask, “How many of you have a negative association with the word ‘retirement?’” It’s common for more than half of them to raise their hands. Then I ask, “what are the words you associate with the term ‘retirement?’” Common responses are: “Uselessness. Unproductive. Death. Out to pasture. No longer relevant. Bored.” I know it’s not your intention, but when you broadcast the “retirement” word you may be moving the needle in the wrong direction, especially with financially successful people who like to work. Critical Conversation #6: Mastery at financial benchmarking. This is the skill to handle their financial documents with finesse… without getting deep into the details or the irrelevant stories about the history of each document. This is a 10-minute benchmarking exercise that establishes their current position on the road to achieving their most important goals and fulfilling their most deeply held values. Sometimes the skill is learning what NOT to say. It’s okay to have a thought you don’t express, right? Otherwise, you have LONG meetings that deter people from hiring you. The confused mind says, “We’ll think it over.” Why do they have to think it over? Because there is too much detail to make a decision right now. We value people who simplify our lives and save us time. Are you giving people more information and education than they want or need in order to make a good decision, now, to hire you? The conversation virtuoso manages the flow so people can make a good decision about hiring you to be their financial advisor today. If more people than you would like are leaving your office to “think it over” you have an opportunity to improve in this area. Critical Conversation #7: Mastery to articulate your value promise and make your offer for them to become a client. This is where the rubber meets the road. If you do not get hired by the clients you would like to get hired by, all of the time and effort up to this point is wasted. This is where you monetize. How succinctly and effectively can you articulate your value promise? How well can you answer the two simple client questions, “How much does it cost?” and, “What do I get?” without over-explaining the details or giving a lecture that would only interest a graduate student in economics, but bores your prospects and clients to tears. The most brilliant financial planning technician, the savviest investment advisor, the most talented wealth manager, or the most knowledgeable insurance, estate planning, or tax expert does not stand a chance of building an Ideal Clientele without a high level of skill and confidence with these 7 Critical Conversations. The collective mastery of these 7 Critical Conversations will give you the skill and the confidence to talk to anyone, anytime, anywhere. The skill and confidence to speak with anyone, anytime, anywhere is how you get the clients you really want, build the business you really want, and live the life you really want.